The airshow portion of the event will include incredible performances by some of the best solo and team aerobatic pilots in America, skydiving demonstrations and static displays of the classic warbirds that won our freedom in World War II – as well as those defending that freedom today. The inaugural Go Wheels Up! Texas Air Show will include incredible performances by some of the best solo and team aerobatic pilots in America. Look skyward as Kirby Chambliss and the Red Bull Air Force put on an untethered spectacle along with some of their closest friends. Wax nostalgic as warbirds from generations past grace the sky with their speed and throaty rumble. See the wonder in your kids’ eyes as daredevil skydivers swoop towards the crowd at breathtaking speed. Feel the roar of the afterburners as jets streak across the blue. Join us in the afternoons of May 4th and 5th and watch history unfold! 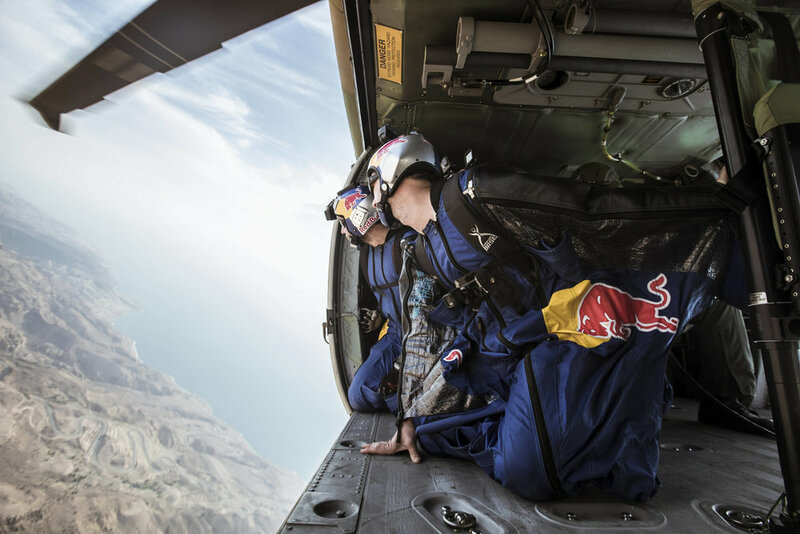 The Red Bull Air Force is a team assembled from the most accomplished and experienced aviation experts on the planet. They specialize in highly coordinated aerial jump demonstrations and continually push the limits of human flight. Their mission is to push the limits of human flight. They continually rethink what is possible and envision a world where all people live with boldness. They strive to bring that to reality. It starts with a core belief. They believe that humans were always meant to fly. We relentlessly pursue that which is thought impossible. And then they go and do it. Come witness these great artists defy gravity in San Marcos, TX! Re-live history and ride in the most awe-inspiring fighter of World War II. This unique in-the-air experience allows you to experience the sights and sounds, the smell and feel of what it was like to fly the P-51 Mustang. Your pilot will take you through it's paces, and give you a running dialogue to help make the most of this historical experience. Don't miss this "once-in-a-lifetime" experience. It is a definite must for your bucket list. “When I was 21 years old flying corporate for La Quinta Motor Inn, our chief pilot was a really smart guy and he said, ‘Hey, if this jet ever ends up upside down with a CEO on board, we want you to be able to turn it right side up without killing everyone.’ I thought, ‘Makes sense to me!’” From that point on, flying became more than Kirby had ever imagined. As a child, Kirby was always playing and running around with toy planes. “I don’t ever remember saying I wanted to be a pilot, I just always wanted to be a pilot.” At only 13 years old, he began flying. By 24, he was the youngest commercial pilot at Southwest Airlines and made captain by 28. Although he enjoyed flying commercial, it became a means to pay for his true love for aerobatics. Kirby continuously trained to perfect his aerobatic skills and routines, which he was able to display at various air shows. There, he began to establish his continuously growing fan base and earned recognition for his skills with an acceptance onto the U.S. National Aerobatic Team. To date, Kirby has accumulated 13 medals in world competition. By the early 2000’s, Kirby was recognized as one of the top 15 aerobatic pilots in the world and was asked to compete in the very first Red Bull Air Race. He transferred his explosive, aggressive flying style to the racetrack and is now a two time Red Bull Air Race World Champion. When not flying, Kirby enjoys jumping out of airplanes and perfecting his skydiving skills. Why jump out of a perfectly good airplane, you ask? Because he has a perfectly good parachute, of course! Randy W. Ball / MiG Pilot, is North America’s Premier Jet Demonstration Pilot. Randy has performed well over 1,000 performances to date! No other North American Jet Demo pilot even comes close to that number of performances. In fact, Randy is the only Jet Demo pilot (military or civilian) to be granted both a day and night unlimited aerobatic rating in jet fighters by the FAA. He has flown over 42 different types of aircraft, manufactured in nine countries. As a youngster Randy’s father took him flying occasionally, and he spent countless hours with one of his heroes, his Great Uncle Gilbert Ball, who flew 56 missions over Europe flying the B-17 Flying Fortress. Even before college, Randy knew he wanted to fly. By the time he was 13 years old, he had already taken off and landed a plane with his father and soloed at the age of 18. Randy volunteered to work in his first air show in 1982 and flew in his first air show more than 26 years ago. He now performs throughout North America, from Canada to Mexico. Matt Younkin is a third generation pilot. He is the son of legendary airshow pilot Bobby Younkin, who is famous for his amazing aerobatic displays in the AT-6, Beech 18, Learjet 23, Samson, and most recently, the Super Decathlon. 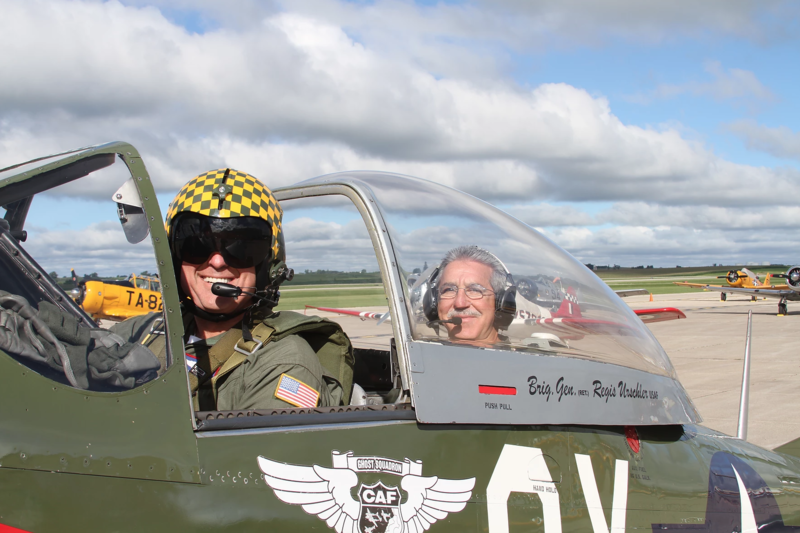 Bobby is considered to be one of the greatest airshow pilots of all time. Matt learned to fly at the age of 14 from family friend Ken Collier in a Piper J-3 Cub. At age 15, Chuck Irvin, the same instructor who taught Bobby how to fly, refined Matt’s piloting skills. On his sixteenth birthday, Matt soloed his grandfather’s 1928 Travel Air 4000 biplane. Matt is now proficient in over 85 types of airplanes ranging from the Piper Cub to the Boeing B-29. He is also a fully rated flight instructor and now has almost 5,000 hours of total flying time and currently resides in Siloam Springs, AR. Matt is also an accomplished radio-controlled model airplane pilot. Like his father before him, Matt learned most of his aerobatic skills by flying R/C models and later refined them in the Super Decathlon. When Matt took the Decathlon out to perfect his slow rolls, he soon discovered that he could perform every maneuver that Bobby performed in the airplane, plus a few new ones of his own. Matt’s latest and greatest achievement is perfecting the world’s only night aerobatic display in the Beech 18. Equipped with 17 spotlights and 13 strobes, the top airplane appears to glow in the dark while the bottom side twinkles violently. Combined with smoke, noise, choreography, and an incredible musical score, the Twin Beech Night Spectacular is quickly becoming one of the most sought after acts in the airshow arena. Bobby always said, “An airshow act must be unique and original to be successful. People come to airshows to see the impossible take place.” Matt is keeping with the Younkin Airshows tradition by performing unique aerobatics in precision aircraft and precision aerobatics in unique aircraft. 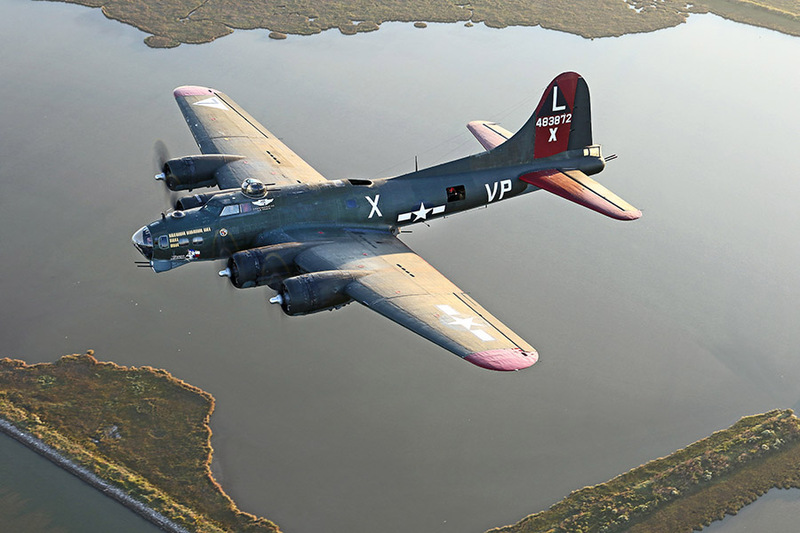 The Commemorative Air Force has assigned Larry as the Primary Sponsor and Aircraft Coordinator for Gunfighter. As such, Lumpy leads the team that keeps our Gunfighter on tour. Lumpy began his flying career in 1979 as a Flight Instructor in Omaha, NE after serving in the US Air Force. He instructed for 2 years while attending college. He began flying a variety of business aircraft as a corporate pilot until he joined a major airline in 1986. He has recently retired as an Airbus A320 Captain and has accumulated over 27,000 total hours of flight time, of which over 1,200 hours are in the P-51 Mustang. There are few pilots on this planet who like to cheat gravity more than JOE SHETTERLY… This guy flat out loves to fly! And since his first lesson as a toddler, perched on thick pillows in a snug cockpit next to his father, Greg … well, he’s been finding creative ways to break contact with terra firma literally all – his – life. With limited opportunities to fly full-scale airplanes as a young boy, Joe built and flew gas-powered control-line models – something generations of Shetterly boys had enjoyed before him. Soon he was winning radio-controlled aircraft competitions, performing many of the maneuvers that you can see him perform at air shows across North America today. Only now, you might say, he’s got more skin in the game. Not surprisingly, Joe soloed an airplane at his first legal opportunity: his 16th Birthday. Meeting the FAA minimum age requirement, he earned his private pilot’s license at just 17, while still a teenager, Joe began competing in aerobatics! While earning an undergraduate degree in Engineering at the University of Kansas, Joe worked as a full-time flight instructor to help pay his way through school. In 2009, Rifle earned a Master of Aeronautical Science degree from Embry Riddle, and was selected as the Air Force’s A-10 Demonstration Pilot flying nearly 250 aerobatic demonstrations in the Hog! Rifle is an active instructor pilot in the mighty A-10 and holds an Air Transport Pilot Certificate with commercial privileges in gliders, single-engine, and multi-engine airplanes. He has logged more than 5000 hours in 133 different makes and models to date, with 2000+ in the A-10, and 1500+ as a civilian flight instructor. He has test flown – performed the very first flights – in 6 different experimental aircraft! Joe hopes that his air show performances might spark an interest in aviation. Learn to fly! … Pursue your dreams! … Take the shot! Kent Pietsch fell in love with flying when he was four years-old. Five decades later, his passion has not waned. Since 1973, Kent has performed his incredible aerobatic routines for millions of people at more than 400 shows that have taken him to quality venues throughout the United States. Kent grew up in Minot, North Dakota, where every day after school, he’d find a way to get to the airport, and do whatever it took to get into an airplane. While most aerobatic performers have one basic program, Kent executes three storied acts that leave spectators mesmerized. These include a dead-stick (turning the engine off) routine from 6,000 feet and a rooftop landing on a moving RV! However, Kent is best known for a comedy act that features a detached aileron (wing flap) and a mesmerizing wingtip-scraping pass down the runway that you must see to believe. When Kent is at the controls of his plane, it is impossible not to watch him perform. Kent loves to fly, but the audience is always his number-one priority. “If you can’t entertain, you have no business being out there,” he said. “The gratification is in knowing that people are enjoying themselves.” Kent’s humble nature and willingness to interact with fans make him a crowd favorite wherever he performs.